"All of my memories begin here, in the pages of my sister's book. Looking back, I remember how Mary filled it with laughter, smiles, and magic. But I didn't understand any of that. I only believed in forgetting, until Mary taught me how to turn the pages of my own life." The Book of Stars is a powerful tale of love between two sisters and the problems that each must overcome. They are both, perhaps, short on time, but for entirely different reasons. One treads water in a sea of dreadful illness, the other in a sea of decadence she has long since swum into. Penny and Mary are sisters living together in a tenement apartment in a seedy section of an unnamed city. There is a sizable age difference between the two, yet they remain very close, perhaps because of the hurdles they have jumped together (the tragic death of their parents years before, et. al.). The younger of the two, Mary (Malone), is rapidly approaching her sixteenth birthday, and it may be her last. She has cystic fibrosis, and the deterioration of her lungs is rapidly worsening. Forced to spend most of her time indoors, she has tracked her life and dreams and hopes in an extremely artistic scrapbook which she calls her "Book of Stars and Lovely Things." In it, she fashions herself an astronaut, cut adrift in space and slowly and helplessly drifting towards the sun and her eventual doom. Her older sister, Penny, was once artistic herself, having written and published a book of poetry. Perhaps the cold realities of life and having to provide for both herself and her sister have overwhelmed her as she has resorted to a life of prostitution and, unfortunately, drug addiction. Penny has a symbolic self-representation as well. She fashions herself a star that has long burned out but which other people can still see because the light takes so long to travel from there to here. We get to know the sisters by the way they interact with each other and with the people they know. There is "The Professor" (Lindo), a crotchety welfare recipient who lives in his library like a palace and takes care of Mary when Penny is too busy working the streets, or too strung out, to do it herself. There is the quiet young man who has moved in next door. He is from war-torn Eastern Europe and walks with a limp. Finally, there is the nameless prisoner who has read Penny's poetry and writes her admiring letters. She won't answer, or even read, the letters so Mary does it for her. This is the first film that Miner has directed in ten years, the last being the 1989 B-action flick Deadly Weapon. I don't know where he has been the last ten years, perhaps learning how to direct? If so, he has learned well. His visual style and adept use of camera angles and color breathes wondrous life into a compelling screenplay from Tasca Shadix. The pages of Mary's book become part of the story in a way that reminded me somewhat of 1988's Paperhouse. Miner's style threatens to become heavy handed in places but never really does. His efforts are bolstered greatly by a collection of terrific performances from the cast. Screen veterans Masterson and Lindo are both utterly convincing in their roles but the real gem here is 15-year old Jena Malone (Stepmom, Contact). The entire film depends on a strong performance from her and she pulls it off admirably. I expect more great things from her in the future. 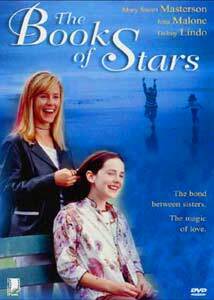 Yes, The Book of Stars almost certainly qualifies as a "chick flick," a la Beaches. If many of your favorite films feature Jean-Claude Van Damme you might as well skip this one. If not, this one is certainly worth a look. The Book of Stars attempts to be powerful, moving, and inspirational, and it quite admirably succeeds at being all three. Bring tissues. Image Transfer Review: The Book of Stars is offered with an anamorphic transfer in its original aspect ratio of 1.85:1. The print contains an average amount if film blemishing and the colors are a tad muted through much of the film. The image is clear but not particularly crisp. Despite a few flaws, the transfer is pleasing and warm. Not reference quality but not bad. Audio Transfer Review: The Book of Stars is presented in Dolby Stereo. The sound tends be a bit muddled in places and generally lacks a high amount of crispness. However, for a stereo track the sound is surprisingly enveloping and dialogue remains pretty clear throughout. Extras Review: The Book of Stars is very light on extras. Outside of the theatrical trailer, cast filmographies, no bios, and production credits are included. The Book of Stars is a moving drama about two sisters, both on the down slopes of their lives but in entirely different ways. Definitely worth a look.